Pacon ArtKraft Duo-Finish Paper is ideal for any arts and crafts project. Each roll is 4-feet tall by 200-feet long, so you’ll have plenty of paper for any project. The paper is manufactured with a special process that gives it extra strength, making it resistant to tears and punctures. One side is smooth, and is ideal for felt pens, finger painting, and fine-line drawing. The other side has a superior “toothy” surface, which is great for chalk, tempera, watercolor, and acrylic paints. Each paper roll is both acid free and recyclable. 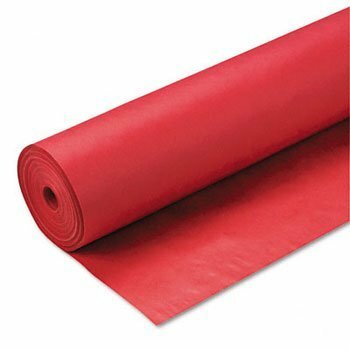 This Pacon ArtKraft Duo-Finish Paper Roll is Scarlet red in color. Pacon ArtKraft paper allows you to let your imagination shine!